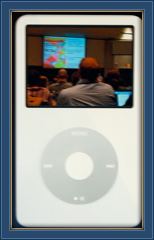 The ability to pause and rewind podcast lectures gave the upper hand to college students in a recent study that compared the performance of students who attended a lecture in person and those who viewed it from iTunes University. The study, "iTunes University and the Classroom: Can Podcasts Replace Professors?," was conducted at the State University of New York Fredonia. It called for some introductory psychology students to watch a recorded lecture available online and others to attend a traditional classroom lecture. Students who watched the lecture podcast--available from the iTunes U online video library--scored an average of 71 percent. Students who sat through the 30-minute classroom lecture scored an average of 62 percent, according to the study. Dani McKinney, the study's lead researcher, said test scores were most dramatically affected by note taking. Students who watched the video lecture and took notes, McKinney said, scored an average of 15 points higher than their peers in the lecture hall. "iTunes University and the Classroom: Can Podcasts Replace Professors?" Google Inc. has launched a new version of its Google Earth software that allows users to explore the oceans, view images of Mars, and watch regions of the Earth change over time. The new features mark a significant upgrade to Google Earth, a popular software program that provides access to the world’s geographical information through digital maps, satellite imagery, and the company’s search tools. 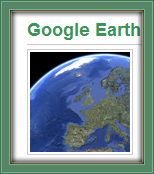 Google Earth 5.0 was unveiled at the California Academy of Sciences in San Francisco, where former Vice President Al Gore, singer Jimmy Buffet, and others spoke about its capacity to educate the public about global warming, ocean acidification, and other threats to the planet. “This is an extremely powerful educational tool,” said Gore, who won a Nobel Peace Prize for his work raising awareness about climate change. Audio is now available of a recent interview Stephen Downes did for Xiphos. 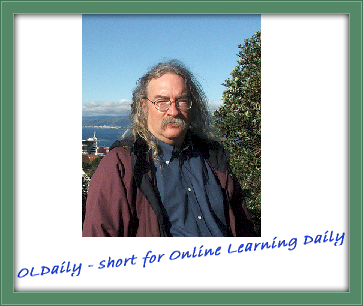 Paul Miller writes, "We discuss OLDaily, before turning to explore Stephen's current research interests in such diverse areas as the Personal Learning Environment (PLE) and 'connectivism.'" Following is the upcoming workshops. Podcasting has had a revolutionary impact on formal and informal teaching and learning. Rising out of the advent of the Apple iPod, podcasts have grown into the mainstream of online media since their inception in early 2004. The power of the individual to use podcasts to communicate globally has important implications for educators. Moodle is an open source web-based learning management system and a low cost alternative for educators to create vibrant online content. The development of the Moodle platform was guided by a social constructionist framework of education which assumes that the knowledge a student receives is produced by the groups to which he or she belongs, or by their particular discourse agreements. Moodle tools have an emphasis on: group work, collaboration, communication, sharing, activities, and critical reflection. Second Life, an online virtual world, has become one of the web's most popular activities and an increasingly popular venue for teaching and socialization among educators. Second Life immerses participants in a virtual world of their own making. Second Life enables educators to offer data visualization, simple simulations, and collaborative spaces to either augment their online course or serve as their online classroom. Online educators need to understand their own liability for copyright infringement when using materials to supplement an online course. Copyright owners have sued and will continue to sue individuals. You also need to know how your original works can be protected. Publishers and the academic community have established a set of educational fair use guidelines to provide standards and protection for educators. The topic of retention continues to gain interest across the fields of higher education. Online student retention rates are significantly lower than their on-campus equivalents. With record numbers of students studying online, it is imperative that academic institutions discover why online learners have a significantly lower rate of persistence than on-campus students. Jennifer Backowski, Atomic Learning, Inc. has been in touch to reminds us about the following event. Are you leveraging education funding grant opportunities? Knowing the grant writing process is essential for applying for both existing grants and new opportunities from the stimulus package. 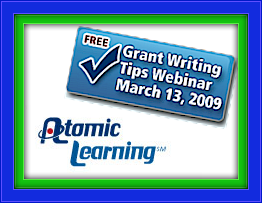 Atomic Learning and ISTE invite you to a free Grant Writing Tips and Tricks webinar to help your grant writing plans. Attend this webinar to learn grant writing tips to maximize available funding. This is a no cost grant training opportunity. In addition to grant tips, we'll hear from Hilary Goldmann, Director of Government Affairs at the International Society for Technology in Education (ISTE). John Eivind Storvik, Norge har gjort opmærksom på dette initiativ mth. deling af ressourser for lærere, pædagoger, forskere og andre som er intereseret i IKT i undervisningen. d&b er et nyoprettet, socialt netsted, med en målsætning om at være et forum for læring, netværksbygning og udforskning af pædagogisk brug af social web og IKT i undervisningen. Grundlæggeren af netværket, Ingunn Kjøl Wiig, er lektor ved Sandvika videregående skole og engageret skoleblogger/social netværker. Med sig har hun en gruppe moderatorer Guttorm Hveem, Svend Andreas Horgen og Margreta Tveisme , og en hurtig stigende medlemsgruppe, der i øjeblikket er ca. 400. Rolf-Anders Moldeklev er ansvarlig for at organisere wikien. 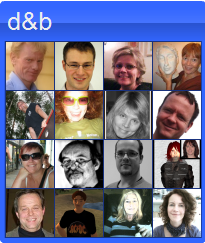 I tilknytning til d&b er der oprettet en wiki, som er tænkt som en ressourcebank for lærere og andre som er interesseret i at bruge flere digitale ressourcer i undervisningen, eller er optaget af sociale medier og digitale læremidler. Del og bruk 09 er et godt eksempel på brug af social web i arbejde med digitale kompetenser i skolen, og på en god delingskultur. En stor tak til John for oplysningen! Are You Interested In Teaching College Math? 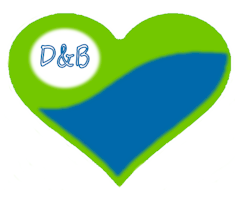 Maria Andersen has been in touch to reminds us about her blog is moving. 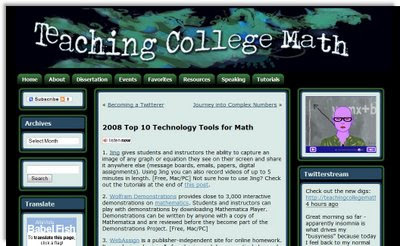 The blog is still TeachingCollegeMath, but it's relocated to the domain www.teachingcollegemath.com. All the posts and comments have been duplicated on the new site. Maria think the new site is easier to read and navigate. The text of posts is now in black (instead of white on black). On this site you can find all sorts of resources for math, technology, and teaching. The site should be very helpful for anyone who wants to incorporate Internet materials into their math courses. Go to www.teachingcollegemath.com and enjoy! Today I have Holly McCarthy guest blogging. Please be sure to check out her guest post. With the constant ebb and flow of information on the web these days, it’s sometimes hard to get a handle on where the truth ends and fabrication begins. However, over the last couple of years, many major institutions of higher learning have been posting lectures, notes, reading materials, and much more for courses available for audit online. MIT, Harvard, and Yale are among the prestigious institutions offering these courses for free. 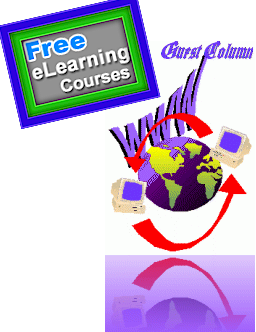 There are many benefits of eLearning, especially with free courseware. A handful of those benefits will be explored below. While studying philosophy may be something you’ve always wanted do, you may already have some of the fundamentals in place. If that is the case, you can skip over the introductory lectures and get right to the heart of the matter. Being able to choose which lectures you attend allows you the freedom to take in as much or as little as you can handle at a time. We live in a very fast-paced world that doesn’t allow very much flexibility. Fortunately, eLearning courses are designed with this in mind. You can take these courses at your leisure and at a pace that you can handle. Best of all, they are free, so you can return to your studies without worrying about deadlines and paying to retake the class. ELearning has made excessive note taking a thing of the past. With the ability to view or listen to lectures a second and third time if necessary, students can really work on learning the information rather than trying to cram for arbitrary examinations. For clarification, message boards are available so that you can discuss different topics with other students. For whatever reason, there are many people out there who weren’t able to attend an Ivy League school. Although these free course don’t offer college credit, the knowledge that you gain will certainly benefit you if put to good use. Rather than sitting idly by, invest some free time learning something that you always wanted to learn from the best and brightest minds in academia. If you are currently enrolled in college, these courses can certainly help you with your current course load. Use the free courseware to supplement your classes, gain perspectives, and engage the material at a deeper level. It certainly couldn’t hurt and may ultimately help you to achieve greater success in your classes with your term papers, exams, and discussions. This post was contributed by Holly McCarthy, who writes on the subject of the best online universities. She invites your feedback at her email address. Many thanks to Holly McCarthy.